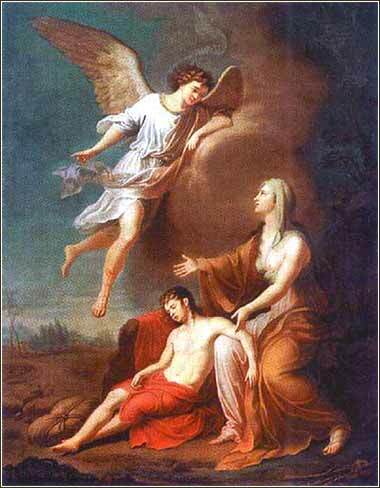 The angel of the Lord found Hagar by a spring of water in the wilderness, the spring on the way to Shur. And he said, "Hagar, servant of Sarai, where have you come from and where are you going?" She said, "I am fleeing from my mistress Sarai." The angel of the Lord said to her, "Return to your mistress and submit to her." The angel of the Lord also said to her, "I will surely multiply your offspring so that they cannot be numbered for multitude." And the angel of the Lord said to her, "Behold, you are pregnant and shall bear a son. You shall call his name Ishmael, because the Lord has listened to your affliction. He shall be a wild donkey of a man, his hand against everyone and everyone's hand against him, and he shall dwell over against all his kinsmen." So she called the name of the Lord who spoke to her, "You are a God of seeing," for she said, "Truly here I have seen him who looks after me." Therefore the well was called Beer-lahai-roi; it lies between Kadesh and Bered. Shur — a place one encounters repeatedly in Exodus — is the desert wilderness in the northern Sinai. Amazing as it may seem, we know exactly where Beer-lahai-roi is. Many of the places mentioned in Genesis have been lost, largely because they are towns in areas which have been overrun, reinhabited, destroyed and built over countless times in the 30+ centuries since Abraham. But this well is in the middle of nowhere; it is a geographical feature known to anyone crossing the Sinai and has kept its name to this day. But there, alone in the middle of nowhere, one of the oddest things in the Bible occurs. God becomes involved in the life of Hagar's son, even giving him the name Ishmael, which fittingly means "God has paid attention".